On receiving the Self-Study Report submitted by Kannada University, Hampi (Karnataka) expressing its desire to be assessed and accredited by NAAC, the latter constituted a team of Peers consisting of Prof. Pabitra Bushan Sarkar, Vice-chairman, West Bangal State Council for Higher Education, Kolkata and Former Vice-chancellor, Rabindra Bharathi University, Kolkata as Chairman and Prof. J.M. Naidu, Former Registrar and Professor of Anthropology, Andhra University, Vishakapatnam, Prof. K. Paddayya, Professor of Geo-Archaeology, Deccan College, Puna, Prof. B.S. Sharma, Head, Dept. of Visual Arts, Banasthali Vidyapeetha, Rajasthan and Prof. K. Nagaraj, Department of Economics, Madras Institute of Development Studies, Chennai as members visited the University from January 29th-Februay 1st 2003. The visit was co-ordinate by Mr. B.S. Madhukar, Deputy Adviser, NAAC. The following are the observations made by the Team after a visit and examination of the facilities prevailing at the University. Our examination of the Self-Study Report of Kannada University presented in three parts gives only a partial idea of its uniqueness until we visited it in person and saw with our own eyes its physical environments and felt, after holding discussions with the Vice Chancellor, teachers, members of the Syndicate, students, administrative and service staff, and some others interested in the Progress of the University, the kind of idealism and vision with which the University was planned and given shape. About the last, the members of the Peer Team kept in mind the objectives of the University as spelled out in the Kannada vishwavidyalaya Adhiniyama (Karnataka Act 23 of 1991) on the basis of which the University was established, with Dr. Chandrashekhara Kambara as the Special Officer, later appointed the first Vice Chancellor of the new University. Dr. Kambar gave definite directions in which the University was to grow and progress and his successor Dr. Kalburgi translated many of his dreams into reality. The present Vice Chancellor, Dr. Lakkappa Gowda is continuing and expanding their work with verve and tenacity, further elaborating the dream. The Objectives were clearly spelt out in Chapter II of the said Act. We quote only some of them in order to remind ourselves that this University is a special kind of institution, and stands far apart from a conventional university. The Act enjoined that this University: “should functions as a high level research center in Kannada Language and Literature”. Further, it is to impart training to those desirous of studying Kannada Language and Literature. In addition, it has “to facilitate and regulate advanced study and research in fields like Art, Archeology, Architecture, Literature, Grammar, Linguistics, Epigraphy, History, Religion Philosophy, Geography, Earth Sciences, Astronomy, Ayurveda, Siddha Medicine, Handicraft, Engineering Sciences and any other Science that have developed in Kannada Language and Literature”. We need not quote from the Act all the objective enlisted in the same chapter to understand the unique nature of the Institution. A look at how it has evolved in about a decade is sufficient to reinforce that understanding. Located in a spacious and attractive natural setting at Hampi, a place, which, in spite of its economic backwardness today, still retains the memory of the high glory of the Vijayanagara Kingdom, whose relics are found everywhere in the locality. It was only appropriate that such a University would have Hampi, a major base of Kannada culture, as its seat. By making Hampi the location of the new University, its founding fathers also sought, it seems, to bring into focus the cultural importance of the North Karnataka region, which has, in the course of history, lost out to its southern counterpart in terms of economic development. There have of course been universities before which focused on a single language and culture, In contradistinction to them, Kannada University, the Peer Team feels, is the one which has resisted the temptation to become a conventional University in order to accommodate a huge load of teaching programme, admitting hundreds of students seeking conventional degrees. Its emphasis on research and production of knowledge continues unhampered. The university is placed far away from the humdrum of urban existence, on a hilly terrain that provides an ideal milieu for undisturbed intellectual pursuits. Beginning its academic function in 1992, it has so far been able to establish four faculties comprising of 16 departments in all, every one of them engaged in vigorous research activity. The Faculty of Language consists of the departments of Kannada Language and Literature, Kannada Language, Dravidian Cultural Studies, Translation, Manuscript logy and Women Studies. The Faculty of Fine Arts has departments of Sculpture and Iconography, Painting and other Visual Arts and the Department of Music and Dance. Whereas the departments Folklore Studies, History, Archaeology, Epigraphy, Tribal Studies, Anthropology and Developmental Studies Constitute the Social Science Faculty of these, as we found out, the Department of Anthropology is not functioning now due to the lack of qualified teachers and others constraints, and the component of Dance is still to be introduced in the Music and Dance Department. Such developmental setbacks often take place when the nature of university is unusual and further, it is situated far away from large city-centers. Apart from these regular departments, there are four Chairs instituted by the University for well-defined and specified studies in Dalit Culture, Shantaveri Gopalgowda, Shamba joshi and Purandar Dasa. The Self-Assessment Report of the University states that it would like to establish three more departments and seven more chairs, widening the scope of area study and research. We will not, at this juncture, go into the merits or feasibility of what the University would like to have in future, but will, in stead, have a look at what it has done so far. In doing so, we find that the University has been able to build itself up as a unique center of research in Kannada Language as was envisioned in the Act that lead to its establishment. It has a balanced emphasis on both the past and present issues of the region. We must hasten to add that we do not consider past, present and future are fully segmented and distant entities with no impact on one another. In a country like ours, the past coexists with the present, and the future, in its turn, is shaped by both. When we categorize the departments in terms of such time segments, we do that only for convenience’s sake. Departments of Manuscript logy, folklore Studies, History, Archaeology, Epigraphy and that of Sculpture in its component of Iconography have the Past as their major area of attention, while other look at the present status of the region and its people from a developmental point of view, which covers language, literature, women, tribal communities, Dalits etc. We think such judicious choice is to be maintained in the University’s future plans for adding departments and chairs. We as a Peer Team, face a peculiar kind of dilemma when we come to assess and accredit such a monolingual, regionally focused and research-oriented University. The component of teaching learning transaction is much less here compared to other conventional universities. Only the departments of Music and those in Visual Arts impart some teaching and training to a handful of learners. And the distance education programme, of course, of course, has a large component of teaching. This year, in addition, a new course of integrated M. A. Ph. D has been introduced which will have regular semesters of teaching, leading to research. As of now, however, teaching is not a major responsibility with the teachers, who are engaged in almost breathless research activity. This has been further highlighted by the comparative young age of the University. It has, we think covered a lot, given the short time in which it had at its disposal. Here is an institution, then, where the regular norms of NAAC evaluation cannot be applied mechanically, and have to be suitably adjusted to the distinctive nature of the Institution. Keeping this in view, we proceed to make the following statements, first as general evaluator observations on the strengths of the University and the likely pitfalls it may have to guard against; and then as criterion-wise comments. Its should be pointed out at the outset that the various programmes of research and teaching developed by the University are fully in keeping with to overall mission which it was set up, viz. a) to carry out interdisciplinary research on socio-cultural and historical aspects of Karnataka and Kannada Language, literature and culture and b) to communicate the results both to the scholars and the public in Kannada language, Initially, the faculty and doctoral research were the thrust areas of the university’s academic programme. Recently, however, some undergraduate and postgraduate courses have also been initiated. The University has thoughtfully made provision for a nodal agency called Adhyayananga for coordinating all its teaching and research programmes. The Peer Team feels that, in terns of its basic objectives of research and related teaching, the university has done a commendable job. All its departments have shown unusual acumen in pursuing fruitful research, although some of them may have been more productive than others. A notable feature of curriculum development in the university is adoption of a stream-linedprocedure on the one hand and the flexible modality on the other, Regular Boards of Studies, Expert Committees and National curricular sources provide the stream-lining while a degree of involvement of the students in terms of articulating their preferences and felt requirements in the process give it the needed flexibility. Close interactions between the faculty and the students appear to be the major channels for feedback. These interactions take a number of formal and informal forms: regular faculty and student seminars; regular six-months reports submitted by research scholars; continuous education of students bases on assignments and conventional examinations; encouragement of inter-active modes of teaching in the class room appear to be some of these useful mechanisms. The University established a Distance Education Center in 2001 to widen the scope of itsacademic programmes and spread knowledge to a wider section of the society. The Center offers 12 post-graduate diploma courses on various topic; two post-matric courses and one certificate course. Care should be taken so that the energy of the teaching faculty does not get dissipated by so many distance education courses and their time and attention are diverted from research and classroom interaction. The University has a well-planned procedure for devising new teaching programmes and for revising and updating the curricula of existing courses. There is 30% representation each for teaching, fieldwork and project work in the various teaching/research plans. It is also noteworthy that some of the courses are job-oriented. The Peer team however feels that demanding job orientation from its various curricular and research programmeswill be an attempt to divert his from its original course, which is that of research and knowledge development. It should be noted at the outset that the academic programme of the University is done on a rather limited budget. Out of the total budget allocation of the University less than 5% is allotted for the academic programmes. This figure is manifestly low and efforts need to be made for assigning higher amounts. This extra money could be utilized for the improvement of libraries, introduction of field training to students and to initiate more project work. The University however should be praised of what it has done in spite of the paucity of financial support. During the years 2000-2001 and 2001-2002 the University had 278 and 277 working days respectively. Out of these 218 and 217 were teaching days. These figures satisfy the stipulation made by the UGC. It is also heartening to note that teaching is mainly conducted by full-time teachers and the role of part-time teachers is marginal. From these figures it is clear that the research and teaching processes in the University are complementary to each other, as well as uninterrupted and regular. In addition to classroom teaching, it is noteworthy that various Departments adopt other procedures like seminars, projects and field training. The Departments also have provisions for organizing seminars/conference/workshops every year. The University itself has provisions for organizing seminars/conferences and holding of special lectures. At the time of convocation a series of special seminars are held on various topics. Apart from these, the University organizes three series of special lectures. These seminar and lecture series serve to disseminate new ideas and, in addition, serve as a platform for innovating and experimenting with fresh ideas. It is also to be noted that all departments have their own, albeit small, libraries, which are used for references sources by both the faculty and students. It therefore became clear to the Peer Team that the University offers well-designed teaching and learning opportunities to its students and faculty members. The evaluation method being adopted by the University is also to be viewed favorably. Single evaluation is adopted in the case of UG courses (in Music and Visual Arts), while double evaluation (if necessary, a third one), comprising one internal and one external evaluation, is followed for PG courses. In the case of the Ph.D. Programme, he University adopts, like most others, two external and one internal evaluation. The process is completed by open defense. The University adopts both central and door evaluation and question papers are set unit-wise in order to cover all prescribed topics in respective papers. Apart from this, the evaluation procedures incorporate regular assignments and seminars by the PG and Ph.D. students; bi-annual evaluation Ph.D. students on the basis of written notes presented by them etc., thus bringing in it elements of regularity and continuity in evaluation procedures. We may also note what the University conducts the UG and PG examination and announces results regularly, adhering to a strict calendar. The admission procedures adopted by the University appears to be objective and fair. A combination of entrances tests, interview and past academic performances is used for the purpose. The teachers employed by University fulfill qualifications stipulated by the UGC. Out of the total regular faculty strength of 68, 40 teachers have Ph.D. degree to their credit and 11 hold M/Phil degrees. The rest have a Master’s degree. The University provides opportunities to the teaching staff for updating their knowledge base and qualification in their respective domains by access to a reasonable well stocked library and also by allowing them to attend refresher courses, seminars, symposia, guest lectures etc. But their access to computer and internet facilities appears to be rather inadequate. The performance of teachers is monitored by obtaining self-appraisal reports from them, which are submitted for scrutiny to a committee consisting of experts from other universities. The performance of faculty is also evaluated by asking them to give seminars on their ongoing research projects and also by submitting their reports for expert opinion. A modality of evaluation by students may also be introduced at some point. As for faculty development, one notable event during the year 2001-20 is the organization by the University (in collaboration with teachers’ association) of a workshop on research methodology. As many as 50 faculty members participated in this workshop. This may be done every now and then, to keep up with the developments in the area. The University gives further incentive to the faculty to improve their qualification by granting study leave and also sabbatical leave. This is one sphere of academic activity is which the Kannada University has done extremely well. Notwithstanding that this University is a very young institution, the faculty of various departments have so far carried out about 300 research projects. Of these 60 projects are ongoing. Out of the remaining 240 projects more than 200 projects have been carried out and completed by the faculty themselves and the remaining 40 projects have been done so by external scholars. One is also quite impressed by the wide range of topics covered by these research projects. These include archaeological monuments, inscriptions, ancient tanks, various aspects of Kannada language, literature, Karnataka history, folklore, development studies including water filtration projects in villages, folk agriculture terms, manuscriptology, various items pertaining to tribal and women studies, art education etc. The range of topics covered by the external scholars is also quite impressive. In addition to these projects, the University has published Encyclopedias of Language, Handicrafts, Religion and History. Several encyclopedias have already been published and some are under preparation. Noteworthy also are the various series of publications brought out on Temples, Epigraphs and Folk and Tribal studies, which are extremely helpful to research scholars. Particularly commendable in this regard is the enormous volume of documentation that the various departments have built up as part of their research activities. These databases, it should once again be emphasized, relate to under-researched areas, and hence are rarely available or accessible elsewhere. Proper preservation and consolidation of these information bases; providing open access to them to bona fide researches; long term research programmes based on these rare date bases, we believe, should be the priority areas for the University in the coming years. It should also be noted that this voluminous output in the form of projects and the related date bases has already resulted in substantial quality research. That a number of research publications of the University have been selected for coveted awards by the Kannada Sahitya Academy and others testify to this achievement. This research record of the University is all the more creditable, considering the fact the University did not receive any specific research grant from the State Government. The faculty had to depend entirely upon a small development grant from the University and whatever resources that could be mobilized from other organizations. The most striking aspect of the research programme of the University is perhaps that their results are not only meant for higher academic purposes, but also oriented towards benefiting and enlightening the society in general. Concerted efforts have been made by the University to publish the findings in the form of reports and monographs and popular dissemination of the finding through the Press is done on an extensive scale. The publication wing of the university called prasaranga deserves a very special mention in this respect. It has emerged as one of the major publishing houses Karnataka, publishing a book a week. In addition to monographs and project reports, Prasaranga publishers number journals devoted to Kannada studies, folklore, Karnataka studies and Dravidian studies. The Peer Team notes with satisfaction that the University is planning to bring out a journal in English very soon entitle Journal of Karnataka Studies. The Publication unit also brings out two or three periodicals and has also taken up publication of textbooks for the benefit of University students. The Term found that all the volumes published by Prasaranga are tastefully and artistically produced maintaining good publication standard, which shows that much care and efforts have gone behind their preparation. Such a vigorous and highly motivated publication unit has hardly any parallel in other universities, and the Peer Term offers its unqualified praise for its members. Another positive aspect of extension activity concerns publication of more than 100 books for the newly literate persons in Kannada. These books, prepared by the teaching and other staff of the University, were purchases by the State Government for distribution under the Adult Education Scheme. A University of this nature has only limited possibilities for activities like consultancy, extension services etc. All the same the University has made some useful beginning in these areas. Consultancy services offered in various areas such as assessment of quality of translation, training of members of Gram Panchayat and Zilla Parishads, implementation of developmental activities at grass root levels, documentation of heritage sites, folk and tribal culture forms and language use and teaching, and Distance Education started in 2001 are the notable features of the University in this regard. The University has a sprawling campus of about 680 acres at Hampi and a satellite campus 15 acresn at the well-known historical site of Badami located about 125 Kms away from Hampi. The special feature of the Hampi campus it that it is located on a valley setting with fairly thick vegetation preserving many of the indigenous tree, shrub and grass species. Propping up from this valley setting are a number of small and low rocky ridges and table lands. The University authorities have very thoughtfully selected these ridges for constructing various buildings. The architecture of some of these buildings is also noteworthy, as it has taken many elements from the vijayanagara diction of architecture. Some of the buildings are named after key personalities of the medieval empire. It is also to be noted that the buildings of the Tribal Studies Department are constructed keeping in view the tribal housing structures. In short the campus has several unique features of its own, adopted from the natural and historic-cultural heritage of the region. It has wide scope for further expansion of the physical infrastructure. The campus has a helipad bed of its own and it is used for receiving high dignitaries. Except in three or four cases all Departments have independent buildings. Adequate provision is made for teaching and administrative staff within each Department. The other major buildings include the Administrative office, Library and Museum building, Guest House, Publication Building, all of which display a uniform architectural style. A new library building for Kannada books is under construction. The campus has also a provision for some faculty quarters that are temporarily used as hostels for students. A separate ladies hostel is under construction. There is also a small sports center on the campus with facilities available for indoor and outdoor games for both students and staff. There is no health center on the campus but the University has obtained a sum Rs.6.25laksh from the Bellary Zilla Parishad to build a health center. Each Department has a small library of its own consisting of one or two shelves of books. The main Library of the University is located on the first floor of large building while the ground floor is occupied by the museum. The Peer Team is fully satisfied with the facilities that these two units are providing to the staff and students in promoting the interests of various teaching and research programmes. The library is well maintained and has a total collection of about 45,000books. It subscribes to 37 journals in English and 31 journals in Kannada. An Advisory Committee helps the library staff in various administrative matters. The computerization of books and periodicals is in progress. It is to be noted that there are no facilities for interlibrary loan or lending of books. The library has also a good section for manuscripts including an audio-video section. The University museum is also a large one. It has on display both archaeological materials collected from various places in north Karnataka and also a folk section containing fishing and hunting items of some of the surviving simple communities. More judicious planning of its sections remains an imperative. The main administrative building of the Universtiy has a computer unit operating with ten computers. A few Departments are also provided with a computer each. The University has also an Information Centre which provides information not only about Kannada University but also about various places and people of Karnataka. The Peer Team is highly satisfied with the University which has adequate infrastructural and learning resources of various kinds nothing also these are being fully utilized. The Sculpture Park, when fully developed will be a prize piece of the Universtiy to show to the outsiders. The open-air auditorium, Navaranga is also an important part of the mission that this University carries on its shoulder. As it does not have too many departments than it can manage, separate buildings for each of them should be on the cards. Though the students are enrolled from the same state, for a healthy interaction university must encourage and reserve some seats for the students from other states. Here of course the monolingual programme may prove a barrier. Further, there is a need of strengthening students welfare scheme specially in the form of financial assistance for the underprivileged.Also sine new courses like Design, Fabric Printing etc. can create better opportunities for the students seeking jobs.Department of visual Art can provide hobby classes that will strengthen intra departmental activities. The University is managed by various statutory bodies such as Board of Studies, Faculties, Finance Committee, Executive Council and Governing Council of Syndicate. Besides, there are some non-statutory bodies such as Dean’s Committee, Publication Advisory Committee, Library advisory committee, Academic Audit Committee, Grievance redressel committee Purchase Committee, Disciplinary committee etc. The University received grants mainly from the state Government, except for a small assistance from the central government. The research projects are taken up with an assistance of funding agencies such has UGC, ICSSR, ICHR, Central and State Sahitya Academy, Kannada development Authority, IGNCA and such others. The University has set up a permanent fund with the donations from NRIs, which will be used for research, development, Publication and spread of knowledge. The University makes some allocation of funds to each department for research and holding seminars/workshops. There is an internal pre-audit mechanism followed by an local fund audit. Teachers in Every department meet once in a week and discuss important research findings with PEER group and exchange ideas. Students and teachers also interact with each other on every Friday through Study Circle meeting in each Department. 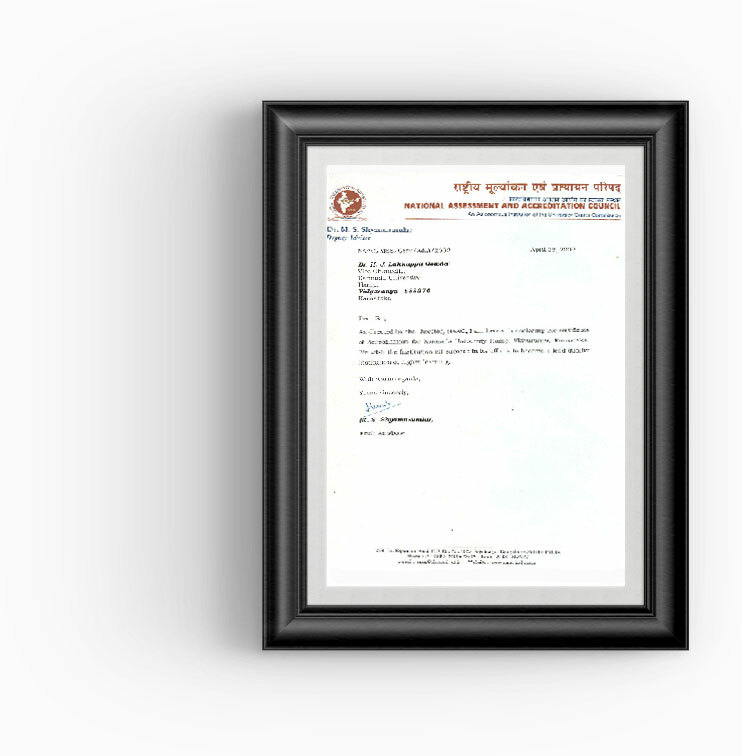 Teachers submit annual self-appraisal reports, which help in realizing their academic performance. An Academic Audit committee monitors the performance of each teacher, department and Un9iversity annually. Redressal of grievances is attended by a committee. The University has adopted a school in the neighborhood with an aim of developing the local communities. One must also appreciate the efforts being made by the University to give counseling to Grama Panchayats and Zilla Panchayats as part of its extension activity. Regular interdisciplinary seminars are providing exposure for teachers and students to emerging knowledge areas. The University holds special seminars at the time of annual convocation. The Department of Sculpture and Painting organizes sculptors and painters camps at National and International levels. This provides a good occasion to staff and students to keep abreast of the latest developments in the contemporary art scene. Traditional artists are also involved in regular teaching work, and this enable the students to be come familiar with traditional techniques of the area. Another notable aspect of the Department concerns equal emphasis placed on practical theoretical knowledge. Both teachers and students are exhibiting their works at state and national levels and have won several awards in painting and sculpture. Alongside with this, research activity has been given full importance. The topics covered include prehistoric to classical traditions of the area. The professional competence of students has enabled them to become good freelance artists and sustain themselves economically. The under privileged SC/ST students are given remedial coaching. Based upon the study of three volumes of self-study report submitted by the University and also arising from the experience of Peer team during the last 3 days the latter would like to record the various positive, commendable aspects of the University. The Peer Team has no hesitation in recording that the University has fulfilled its mission as in institution of higher learning and research, with basic orientation towards Kannada Language, Arts and Culture. We would like to point to the following commendable features in particular. In a short span of time, the University as built up an excellent documentation database through its various schools. This very useful information base is not readily available and accessible through other sources. Secondly, research orientation of the University is broadly what can be termed as its foundation of strength. It has a legitimate emphasis on under-researched and un-researched areas and on marginalized and deprived sections of the society. Thirdly, the University has established strong linkages between research and teaching and has started certain innovative programmes. In this regard the recently introduced integrated M.A. PhD Programme is step in the right direction. Fourthly, although much more needs to be done, the University in a short span of time has built up a good amount of physical academic infrastructure. Lastly, and perhaps the most importantly, the publication activity of the University deserves special praise for the impressive quantity as well as high quality of its output and for its efforts to disseminate its intellectual output to scholars as to the general literate public. The Information Centre of the University is also doing excellent work, the like of which is seldom found in the university system elsewhere. An institution of this nature has to guard against isolationism, fragmentation and a loss of focus in academic matters. While the emphasis on Kannada is understandable, it should not become and end in itself. The University should bear in mind the multicultural context in which it operates. Networking with institutions of higher learning both within the state and outside, spreading out in terms of research and dissemination in languages other than Kannada (including English) would be essential to guard against the isolation. As far as fragmentation in academic pursuits is concerned the University has to institute certain measures for consolidation. Certain departments, for example, may be merged to provide better and more cogent research orientation. The department of History, Archaeology, Epigraphy could work in union; so could the departments of tribal Studies, Folklore, Anthropology, Kannada Language and Literature and Kannada Language Development. Thirdly the emphasis on short-term projects runs the risk of attempted empiricism with insufficient theoretical ground-base. Large long-term research projects that are multi-disciplinary in character involving more than one department of school would have to be planned to guard against such possibilities. For example, a project on manuscript illustrations can be jointly tackled by the departments of Manuscriptology and Fine Arts (Painting). Duplication of projects in various departments should be avoided. In certain fields infrastructure needs improvement, like in computerization, library facilities etc. The Peer Team is apprehensive that new buildings under construction (the girl Students’ Hostel and the Kannada Library) nmay not conform to this broad design. This the University should look into. If possible, the University should organize one or two Art Fairs every year in order to exhibit as well as sell the art objects created by its students and teachers. It should also avail of such opportunities offered by country fairs by opening a stall form which books and artifacts can be sold. The Peer Team thought that the present fair being held at Banashankari was a good occasion to put up a stall. The Pustaka Yatra of the Prasaranga division should also have a component of Shilpa Yatra, as well as that of other materials produced by the University. These other materials may be audio and video cassettes (or CDs) of musical and other performances prepared by the Tribal Studies or Folklore departments, who can sell them to the electronic media and to the general public. We could also emphasize that given the very specified nature and mission of the University, and given that it has done a commendable job in such a short time on a rather restricted budget, to expect that it will raise internal resources on a significant scale in order to maintain and build upon its admirable record, we believe, will be totally unrealistic. We appreciate what it has achieved so far along these lines, including the initiative taken by the present Vice Chancellor in collection MP local area development funds. However, we feel it strongly that it is the State that has established it with a definite mission and philosophy, and it is the State that should bear by far the major responsibility of maintaining and nurturing this distinctive institution with sufficient financial and other support. · Larger consolidated research programs involving a number of faculty members, students and departments and are interdisciplinary in nature should be attempted. · In order to avoid fragmentation and loss of focus in academic qualities a comprehensive reorganizing the departments/programs with analysis on consolidation. · Each School/Faculty should prepare position papers identifying gaps in research and has to provide a roster of researchable issues. · Comprehensive studies on the region in Deccan Karnataka should provide a needed focus. ·The relationship between the academic chairs and departments needs sharper definition and strengthening. · Periodic peer review of individual faculty member, department and schools should be attempted. These reviews should provide the required focus on faculty involved ion active research. · A time span for completion of the research projects to be decided on case ti can basis. Emphasis on completion without full theoretical and pragmatic elaboration which the topic needs should not be forced. · The Ph.D. Program should be dovetailed to the larger research and teaching programme. · Provision for providing assistantship (Teaching & Research) to be explored. · Research scholars should be attached to Schools rather than departments, and course works should devised by the School. · Introduction of tutorial system can be considered. · Translation of few important publications can be taken up in English. · In Explore possibilities for translation, publication& distribution of important works wi5h established national and international publishing houses. · Working paper series of research findings by different schools may be published as a means for dissemination and interaction with peer groups. · Networking with other institution and Universities like IISC, ISAC etc. · Consultancy in possible area may be explored. · The Sculpture department may choose rocks on the roadside to create something out of them. In addition, they may work in places of heritage to leave an imprint of their work there. · As has already been noted, festival and fairs should be utilized by the University. · Earmarking substantial funds for Library for providing more journals, Books and periodicals. · Users survey in the library to be conducted for optimized utilization. · Documentation Center to be established for digitalization of date created in all departments. · Large scale computerization with networking and Internet facility is an immediate requirement. · Commercial utilization of the campus space by way of plantation etc. · Adequate transport facility to be provided by the University. · A long-term vision document for the University to be prepared. · The university may establish statutory Department Research Committee at department level and Board of Research Studies at University level. · A Course in Kannada Journalism (collaboration with Samyuktha Karnataka, Prajavani Etc may be attempted). · Information Centre may explore possibilities of collaboration with newspapers. · Widening curriculum to bring in other forms & cultures -like folk music, western classical music to in music classes. · A Placement/career guidance cell for students may be considered. · Adequate training (Incl. computer training), Institution of career advancement schemes, incentives for involvement in academic activities by the non-academic staff. · Common facilities such as dining hall for lady students, non-teaching staff, and some opportunities for indoor sports/games, Bus Shelter etc may be planned in future. · All the epigraphic data so far available may be converted into electronic form and saved permanently. · Archaeology, ancient history, epigraphy dep0artments need holistic approach in their research. The Peer Team was quite favourably impressed by the progress made by the University in such a short span and also by the earnestness of its community for its development and progress. The Team thanks the Vice chancellor and all his colleagues, big and small, for according to the Team the best of cooperation and other supports that they could offer, and wishes the best for the University.